Manick Sorcar (formal name Prafulla C. Sorcar), an electrical engineer from Bengal, India, came to the U.S. in 1970, received full tuition scholarship and earned a master’s degree in electrical engineering at the University of Washington, Seattle. Earlier, he received his bachelor's degree in EE from BHU (now IIT-BHU, Indian Institute of Technology-Benaras Hindu University), Varanasi, India. A resident of Colorado, he was the CEO/President of Sorcar Engineering, Inc., the roots of which was Howard W. Butterweck and Company, where Sorcar was first employed. In two years he earned the position of the vice president, when the company re-incorporated in 1974, taking him as one of the principals and changing the company's name to "Butterweck-Sorcar Engineering, Inc." This was the same year when Sorcar married his wife, Shikha. After the death of Mr. Butterweck in 2000, the company's name was changed to "Sorcar Engineering, Inc." of which he became the CEO/President. Sorcar is the author of several texts on lighting design which are published by renowned publishers (Rapid Lighting Design & Cost Estimating, McGraw-Hill, 1979, was selected as a 'Book of the Month' by the Architects' Book Club; Energy Saving Lighting Systems, Van Nostrand Reinhold, 1983, a practical application oriented design/reference book; and Architectural Lighting for Commercial Interiors, John Wiley & Sons, 1987, is a popular design book which takes the impact of psychology, physiology, vision, and aesthetics in lighting design). The last two books have been in use as texts for Architectural and Illuminating Engineering at several universities for undergraduate and graduate courses including the University of Colorado, Boulder, PennState University, Pennsylvania, and Jadavpur University, Kolkata, India. Over the years 1972 to 2012, his innovative lighting design has reached several countries through multi-billion dollar projects such as the Denver International Airport, Colorado Convention Center, Denver Justice Center, etc. in the USA; Palace for Prince H.H. Faisal Bin Sultan in Saudi Arabia; Shinurayasu and Musashi-Koshugi sport centers in Japan, to name a few. After 40 years of phenomenal success, Sorcar retired from engineering in 2012. Sorcar's simultaneous love for art and science is something he inherited from his legendary father, Late P. C. Sorcar, the world-renowned magician. As a youngster, apart from being a stage assistant, he helped in painting the backdrops and lighting design for the various massive stage sets of magic items, which led him to become an electrical engineer and artist. In the U.S., his art in many forms flourished simultaneously with engineering. "From the outset his endeavors were underlined by one goal - to bring the East to the West through his innovative creations. The underlying thread that weaved together all of Sorcar's work was art. 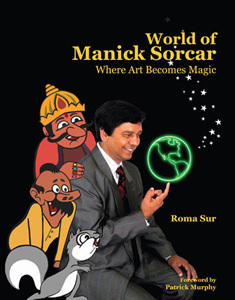 Combining his father's charisma and showmanship with his own artistic insight, Sorcar created a brand of magic which earned him a place in the hearts of thousands all over the world and put him in a niche of his own" (Reprinted from the flap of the book 'World of Manick Sorcar Where Art Becomes Magic', by Roma Sur, Foreword by Patrick Murphy, Executive Director, International Laser Display Association). This website is dedicated only to the art world of Manick Sorcar. Over the first two decades he produced a wide variety of unique arts, which had a strong appeal to people of all ages. His first art exhibition was held in Seattle, Washington, while a student at the university, where all of his works reflected the suffering of the fleeing refugees who poured into India during the war between India and Pakistan. In his later exhibitions he represented rural India and Indian art painted with water and acrylic media. He has always been fond of experimenting and creating novel art work by using unique, unusual material: portraits on peanuts, grains of rice, portraits with fireplace charcoal, life size sculptures curved out of styrofoam, sculptures made out of chicken wires and screen, spice-painting, tile-collage, three dimensional illuminated art work with fiber optics, etc. In 1996, a gallery of portraits of famous people collaged with relevant newspaper pieces was displayed at his art exhibition "IMAGES OF INDIA: Animation/ Transformation", at the prestigious Foothills Art Center, Golden, Colorado. "Artist displays wizardry at Foothills" said The Transcript of Golden, Colorado, "Manick Sorcar, a lighting engineer and artist from Golden, specializes in feats that will astound....Taking on sleight of hand few would attempt the artist has created portraits of Asian and American newsmakers, using as his medium - newspapers!". Sorcar's love of art is seen in everything he touched. His current 8,000 sq. ft. residence with a flavor of Moghul Architecture was fully designed by him and resembles what he calls “mini India”. It is a way for him to be surrounded by his culture while living in the States. Although it is just the place he retires to when he is through with the day, it is acknowledged by the Asian Art Association of the Denver Art Museum as a true Asian experience. Many patrons from the Art Museum toured Sorcar’s home to experience the Asian culture seen within the architecture of the house and the wall paintings and other artwork created by him. 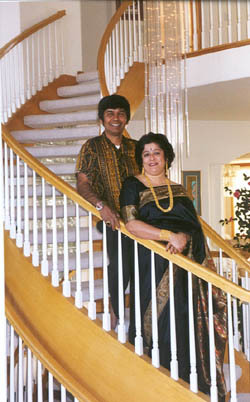 His home was featured in the weekend edition of the Rocky Mountain News of Denver, Colorado and defined as a “Shrine to Indian Culture”. Sorcar's most notable art work came in the last three decades as a series of one-man-animation for children: "East-meets-West" (1986), "East-meets-West, II" (1987), "Two Songs from the East" (1987), "Deepa and Rupa: A Fairy Tale From India" (1990), "The Sage & The Mouse" and "Sniff" (1993), "The Woodcutter's Daughter" (1997), and “The Rule of Twenty-One”(2003), which are not only entertaining, but also educational for their cross-cultural values and innovative arts. In many of these films he uniquely mixed his hand-drawn art with computer-generated art and animation, and several with his animation mixed with live action - along with his original music, to represent the culture of his motherland in a most effective manner. The products were instantly acclaimed in the USA as a "bridge between East and West", got sensational response from the schools, rave reviews from the press, and a host of international awards. He has been a guest lecturer at many schools and universities around the country. Originally Sorcar did not plan to create the bridge on an international level, he just wanted to bridge the gap at home so that his two U.S. born daughters (then 8 and 5, 1985) could share their heritage with India. So he wrote and composed several songs in his native Bengali and had the daughters sing them, which led to a CBS manufactured record and other cassettes which became popular in the U.S. as well as in India. His daughters received the Gold Medal at the Kiwani's "Stars of Tomorrow" contest. One success led to another. In 1986, he started mixing painting with music which led to "Two Children's Songs From the East", "East-meets-West", and "East-meets-West, II". In each of these programs his daughters danced in front of his artwork and animation, which were appreciated and immediately telecast by American CableVision, Colorado, and Doordarshan, India. 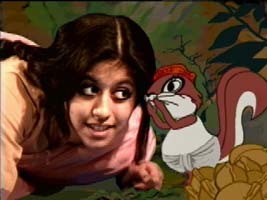 After this, the bridge of culture widened into an international level - he dreamed of making "Deepa & Rupa: A Fairy Tale From India" a half-hour animation mixed with live action for children of all ages - which required substantial financing, thousands of art work, and significant amount of time. Unable to find any external funding, Sorcar financed the art film himself. In order to have the low-budget, high-quality product, he used family members and friends to act various roles and drew the entire art and animation by himself. Each and every one of the hundreds of background scenes were painstakingly hand painted on paper and then frame-captured by a video camera. The moving animations were painted and developed directly on his personal computer - all in his studio in the basement. For three long years (1988-90) he religiously devoted his nights, weekends and all the time he could spare from his electrical engineering business to translate his dream into reality. The hard work paid off. 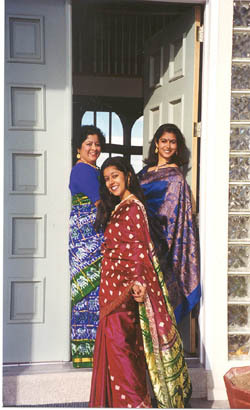 Since its premiere on the PBS Channel (KRMA-TV, Denver) on September 13, 1990, "Deepa & Rupa" was telecast in many parts of the world and received a host of awards including The Gold Plaque at the Chicago International Film Festival, The Golden Eagle by the Council on International Non-Theatrical Events (CINE), Washington, D.C., the Silver and Bronze Medals at the New York International Film and TV Festival, The Cindy Award, Los Angeles, and nominations in three categories for The Heartland Regional Emmy Awards, and a bag full of rave reviews. "Deepa & Rupa humanizes the machine,” said The Denver Post. "Comparing Sorcar's results with tape and computer to those more traditional animations seen on Saturday mornings, he (Manick) just about could be Hanna-Barbera" said the Daily Camera, and "A fairy tale ending for the Golden producer .... in a head-to-head competition, it topped the Children's Workshop's 'The Sesame Street' and Hanna-Barbera's 'The Greatest Adventure' said the Rocky Mountain News regarding the awards it received at the Chicago and New York International Film Festivals. 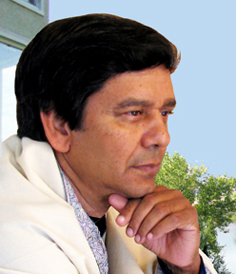 The productions with Indian stories and universal appeal did not go unnoticed by schools, which found his videos to be "An invaluable material. Not only was it an important fairy tale for young children, but also had educational values for high school students studying the many uses of computers" said the Aurora Public Schools of Colorado. Manick started receiving a surge of requests from schools to make presentations of his art-videos and discuss the state-of-the-art technology on computer graphics and animation with the students. All of his videos in general take the young audience to the world of children in India and introduce them to the culture, folklore, and values. "They are entertaining and educational," the academicians from various school organizations paid glowing tribute to Manick's accomplishments saying about the films "they make a rich addition to a school district's multicultural resource library," "an inspiration to our students," and "the storyline is timeless, teaching values which span generations." The chain of success continued in his following productions as well. "The Sage & The Mouse" and "Sniff" (1993) which were 100% animation, took two years to make. The twin were premiered on the PBS television stations of Rocky Mountain area on July 1 and re-telecast on July 4, 1993, the Independence Day of the USA. They received sensational response, again, from the viewers and rave reviews from the press. "Animator preserves cultural legends - reaches children of all ages through work ... he is nothing but success. In the last decade Manick has made major contributions to children's arts and cultural education through a series of self-developed animated programs", said "The Denver Post." "The Golden Transcript" wrote, "His father, P.C. Sorcar, Sr. was a legendary Indian magician, much loved by his fellow countrymen. Now Manick carries on the creation of Magic with a hi-tech edge." Both animations received a host of international awards. 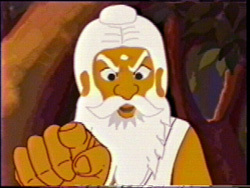 "The Sage & The Mouse," which is based on a fable from the Panchatantra (the classic book of children's stories of India), received the Gold Medal for its music and the Silver Medal for its animation at the New York International Film Festival, and the Bronze Plaque at the Columbus International Film Festival. "Sniff," which is based on Sukumar Ray's famous nonsense poem, received the Golden Eagle awarded by the Council on International Non-theatrical Events (C.I.N.E. ), Washington, D.C. "Sniff brings to life the unforgettable characters of Sukumar Ray's poem," said The Statesman, Calcutta, India, about Manick's animation during its premiere at Doordarshan (Indian national TV), Calcutta. Its telecast in the State of Bengal had a very special significance to all Bengalis as this happened to be the very First animation produced in their native language, and also the very First animation from Sukumar ray's famous book Aabol Taabol. Since 1990, Sorcar's animation films have been telecast by the Rocky Mountain PBS Stations of Colorado, USA, for over two dozen years in a row, celebrating its Silver Jubilee (25 years) telecast on January 1, 2014. 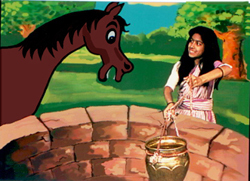 As a year-end special two hour show for children, they are presented either on the Christmas Eve or the New Year's Day, as the "Animation from India, by Manick Sorcar". Based on another story from the Panchatantra, "The Woodcutter's Daughter” was released on September 7, Sunday, 9 am, on KRMA-TV (PBS) channel six in Denver and its affiliated PBS stations around the State of Colorado. Like Deepa & Rupa this, too, was mixed with live action (Sorcar's younger daughter Payal was in the key role) and got rave reviews. At the New York Festivals it was a FINALIST in the Children's Program category. “Rule of Twenty-One,” his latest animation based on another nonsense poem by Sukumar Ray, received the Bronze Plaque at the 51st Columbus International Film Festival, Ohio, USA. It was premiered at Uttam Mancha theatre at Calcutta, India, on December 21, 2002 and at the PBS stations in USA on December 24, 2003. In late 1990s Manick Sorcar took animation to a different level by introducing the cutting edge technology of laser as the medium. His first laser animation "Calcutta Forever," an 8 minute show on the City of Joy was a super hit at Calcutta, India, where it was screened with his other animation films on the Millennium New Year's day inside "Nandan," the prestigious theater of the city. On public demand the show was extended to seven days, twice daily, and hit national news recording it as "The First laser animation screened inside a theater." In 2001, Sorcar lifted the bar for his laser technology when he showcased a live dancer in combination with a life size, on stage, laser-animated figure of her, entitled “Dancing with My Soul” for the first time in the USA. Since then this unique show along with many other items have created sensations around the world. 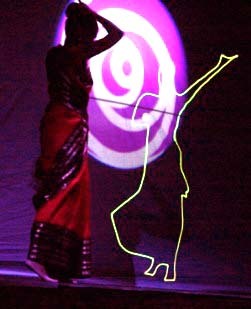 The life size laser figure interacts with the dancer creating a truly multi-media production. "Like da Vinci," wrote The News Record of Cincinnati, Ohio, USA, "Sorcar is nothing short of a renaissance man. By combining laser beams, animation, computer graphics, magic and traditional Indian dances, Sorcar manages to create an awe-inspiring Indian fantasy world." 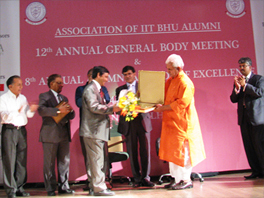 Receiving the Bharat Samman Award. A string of very creative laser shows, performed in a wide variety of prestigious venues followed after this: "Feel Like a Kid Again" at the Pepsi Center indoor stadium (opening show for the football match between Colorado Crush and Grand Rapids Rampage), "Celebrate Denver" at the Opening Ceremony of the $350 million dollar Denver Convention Center, "Back to the Future" for the Gold Rush XVIII at the Two-River Convention Center of Grand Junction, USA, etc. 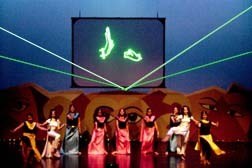 Yet the top award came in 2006, when his "Enlightenment of Buddha," an extravaganza of dance-drama-magic in combination with laser graphics and overhead visual effects won the First Place and bagged the 2005 ILDA Artistic Award for "best use of lasers in a live stage performance" at the ceremony held at Rimini in Italy on March 13. On September 10, 2008, Sorcar received his second ILDA Artistic Award for the laser photography of his laser art "Reflection." He is the first Asian-American to receive the coveted award twice. 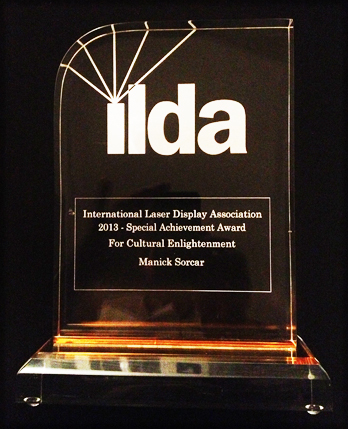 ILDA (International Laser Display Association) awards are considered as the industry's equivalent of Hollywood's Oscars. 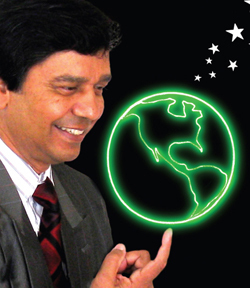 In 2011 his production "Our Republic's Birth" created a sensation when it was displayed at the 61st Republic Day of India celebration for the Consulate General of India at the historic Palace of Fine Arts, San Francisco. The show was attended by 400 international dignitaries including the Mayor of San Francisco, CA. Sorcar's latest production (2012) is the revolutionary "Swamiji", an 1.5 hour laser show on Swami Vivekananda that stormed the world. The premier of this unique show took place on October 10, 2012, at the Grand Theater of the Science City, Kolkata, the largest science center in the Indian subcontinent under National Council of Science Museums, Ministry of Culture, Government of India. The show was inaugurated by Ms. Kumari Selja, then the Honorable Minister for Culture, Housing & Urban Poverty Alleviation, Government of India. To date, it has been displayed in over 40 cities in India and the USA, receiving rave reviews from the press, media and Ramakrishna Missions, in addition to a national telecast in India. Sorcar’s art and animation have been the subject of numerous articles, academic research papers, and books. 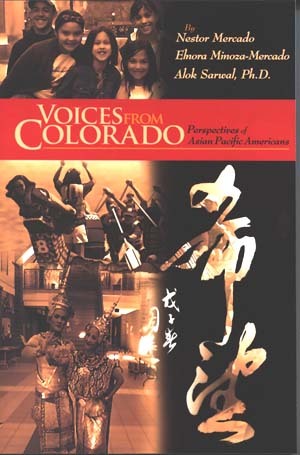 For his simultaneous contribution to art and science, he was acclaimed as "the Renaissance Man of our time" in the book "Voices of Colorado: Perspectives of Asian Americans" by Nestor Mercado, Elnora Minoza-Mercado, and Alok Sarwal. 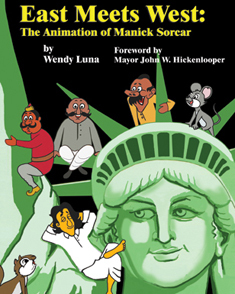 In 2009, he was the subject of the book "World of Manick Sorcar: Where Art Becomes Magic" by Roma Sur, and in 2010, he was the subject of another book "East Meets West: The Animation of Manick Sorcar," by Wendy Luna. In the Foreword of the latter book , John W. Hickenlooper, the then Mayor of Denver - now the honorable Governor of Colorado, wrote "…This book is indeed a treasure in the multicultural wealth of our great nation. It is a tribute to Manick Sorcar, whose animation for the last two decades has both entertained and educated us about India, her culture, her people - all together, a true cultural bridge between East and West, which has made Denver, the United States and India proud." 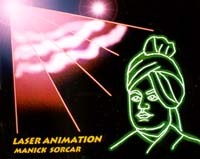 In 2011, Jadavpur University, one of the top ranking universities of India, opened the Manick Sorcar Laser Animation Laboratory, where Sorcar donated laser lab equipment worth more than USD $120,000 and introduced India's first Laser for Art and Animation course as a special application of lighting for degrees in illumination engineering. He serves there as a visiting professor. On January 10, 2011, Sorcar was bestowed with the "Bharat Samman (Honor of India): Achievers Award 2010", at the XXI Annual Meet NRI Divas 2011 of the NRI Institute, New Delhi. 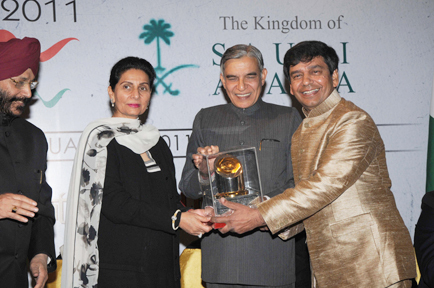 He received the prestigious award from the hands of Sri Pawan Kumar Bansal, the Honorable Union Minister of Parliamentary Affairs, in the presence of Maharani Preneet Kaur, the Honorable Union Minister of State for External Affairs, Govt. of India. On November 6, 2013, Sorcar was honored with the Special Achievement Award for Cultural Enlightenment, for "exceptional merit in using laser display to celebrate India’s heritage, and to prepare the next generation by introducing a course on laser art and animation and establishing the Manick Sorcar Laser Animation Laboratory at Jadavpur University". It was given by the International Laser Display Association, at their 25th Annual Conference at Aalen, Germany. The news was carried internationally by newspapers including the Times of India. Sorcar retired from engineering business in December 2012 to devote all his time in his art of various form. Years ago, he decided not to do stage magic as he was more allured to art and lighting. But magic is in his blood, and creating miracle is his birthright. He keeps on hypnotizing the world with his own brand of magic with materials such as fine arts, cartoons, animations, laser arts, and world-touring stage extravaganza of live action mixed with laser animation, which has created a niche of his own. On May 24, 2014, Sorcar was bestowed with the IIT-BHU Alumni Lifetime Achievement Award 2013-14 for his "outstanding contributions in the field of Cultural and Enlightenment through Science and Arts". He received the award in New Delhi, India from the hands of Manoj Sinha, the Honorable Minister of Railways, Govt. of India.